There’s a great event coming up at WKU on October 24th, and I wanted you to be the first to know about it! Food Day is going to be a day-long conference that will be ideally suited for farmers, foodies, consumers, gardeners… anyone with an interest in food (which should be all of us). Come to the Meet Your Farmer Hayride at WKU on Wednesday night: FREE. Enjoy a delicious local meal at the Farm Elegant Dinner on Wednesday night: $35. Registration is available at the Community Farmers Market website. I look forward to meeting you on the 24th. 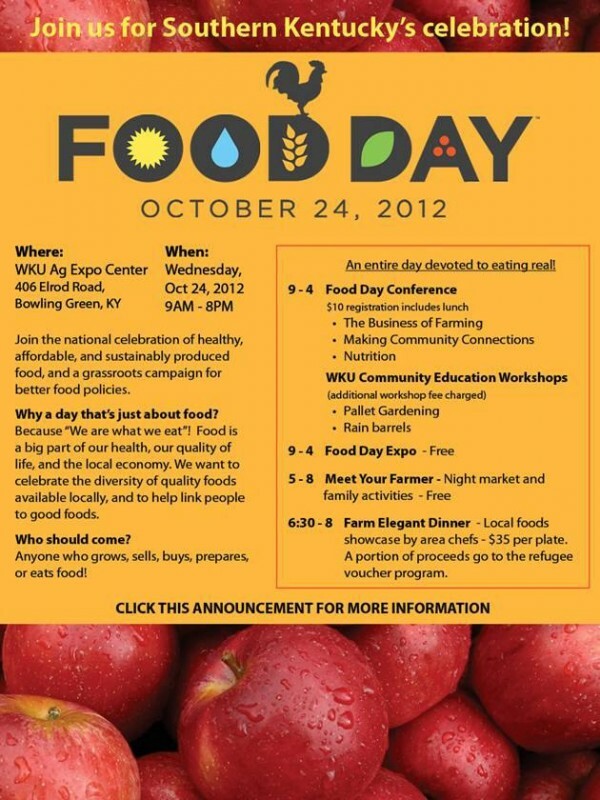 It will be an informative time for those of us concerned with promoting local food and community in the Bluegrass. To enter to win your Food Day tickets, leave a comment on this post. Please help us spread the word about this event on Facebook and Twitter, too. Winner will be selected on October 16th. UPDATE: Lori Monroe is the winner of the Food Day tickets! Comments have now been closed. Disclosure: In accordance with FTC guidelines, I should tell you that Sustainable Kentucky received tickets to the Farm Elegant dinner in exchange for my promotion of Food Day that I would have promoted anyway! Thanks to the organizers of this event for making my attendance possible. I look forward to attending a pallet gardening workshop. With limited yard space this sounds like an intriguing and sustainable option for a home gardener. I’d love to go to this event!! Hope there is a great turnout! Great opportunity! Looks like a fun filled informative day. Would love to attend. Love the promotion of sustainable and local food!